Test materials and certificates are built on uniform principles in each language, tests are pre-tested, test constructors and markers are trained regularly and a system of double marking is used. The only language examination system in the European Union which offers testing in fifteen different languages, including many less widely used languages. You can take an ECL language exam in 26 countries in Europe and two countries overseas (Argentina, United States). We are more than proud to disclose that the experts of ECL Examinations contributed to the further development of the CEFR descriptors. Our professionals took part in the validation of the descriptors for mediation, online interaction, reactions to literature and plurilingual/pluricultural competence, and assisted in their initial piloting. ECL Examinations is opening a new exam centre in Hai Phong, Vietnam. In January 2017, two assessment experts, Ms Réka Werner and Mr Robert Märcz, from the International Centre of ECL Examinations (Pécs, Hungary) provided a week-long training in Hai Phong. 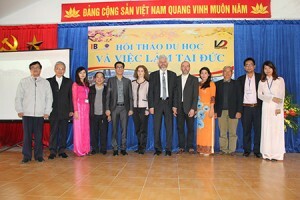 The aim of the programme was to train future examiners who, in the future, would provide ECL exams in German and English languages in Vietnam. According to the 5088/2015 (29.11.2016) regulation of the Romanian Ministry of Education the ECL language examination in English, French, German, Italian and Spanish languages at levels B1, B2 and C1 substitute the foreign language school-leaving examination in Romania. Result calculation at the ECL exam has changed in favor of the examinees. It is not required any more to achieve 60% at both the written and at the oral exam but it is enough to achieve an average 60% in all 4 skills all together in order to have a successful complex exam. The minimum is 40% in each skill. Thus it is possible to compensate the achieved probable weaker result with one or more better result(s) achieved at (an)other skill(s). This change comes into effect from December 2016 exam term and is not valid retroactively. The new way of result calculation is valid for a complex exam completed within one exam term only and it cannot be validated for partial exams (written exam or oral exam) completed in different exam terms.